Anne's Food: Titus cooked lunch! Recently, Titus has started to move his chair over to the kitchen counter, so he can play with the kitchen tools, and reach things. I thought this meant it was time to let him cook, so today, he helped make a farmer's omelette with potatoes, onions, bellpepper, mushrooms and cheese. 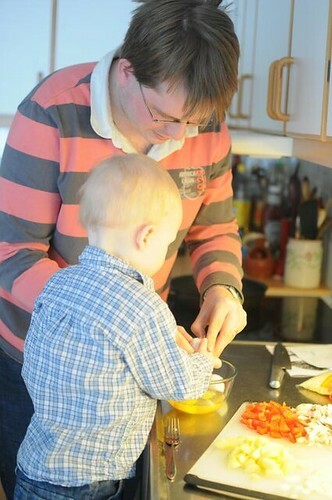 He cracked the eggs, whisked them with a pinch of salt and some water, poured it into the pan and sprinkled the cheese. Pretty darned good for a not-even-two-year-old boy, right?! He also helped clean up, and wiped down the counter. Good boy. And as a bonus, he loved eating what he cooked. Oh look how sweet he is! By the way, Anne, I really like your blog! I was looking for a recipe for oatmeal cookis recently - that's how I came across. And I'm really glad I did :-). So cute! 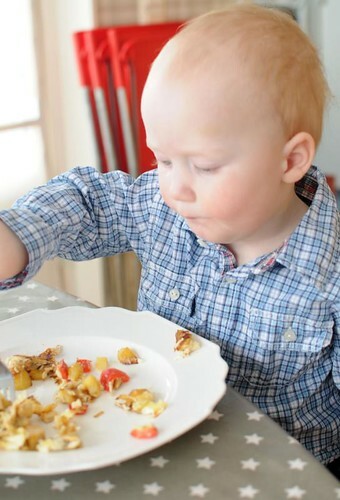 I'd be entirely shocked if he wasn't interested in food and cooking given your his mum :) Probably only 5 more years until he is making you breakfast in bed! Awesome! And he's crazy cute, too.